Soldiers arrest five kidnappers, rescue five hostages in Ondo state – ……news on the go! 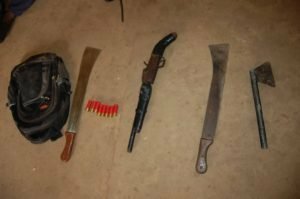 Following credible information of kidnap incident involving nine persons at an Integrated Agric Farm in Owo, Ondo state, troops of 32 Artillery Brigade, Akure in the early hours of Tuesday 16th of April 2019 conducted a raid operation on the kidnappers’ hideout at Jugbere village in Owo Local Government Area of Ondo State. According to a statement from the Assistant Director of Army Public Relations 32 Artillery Brigade, Captain Victor Olukoya, the operation resulted in the arrest of 5 kidnappers and rescue of 5 hostages. “Four other abductees escaped from the kidnappers’ den on arrival of troops. “The rescued hostages and the arrested suspects – who had minor injuries have been taken to the Brigade Medical Centre for medical examination/treatment. “The suspects will be handed over to the appropriate civil security agency at the conclusion of preliminary investigation”, he said. The troops have also reassured residents of Ekiti and Ondo States of the commitment and capability of the Brigade to ensure security of lives and property of law abiding citizens. To this end, the Commander Brigadier General ZL Abubakar has ordered for intense patrol in the states to assist in ensuring peace and security.